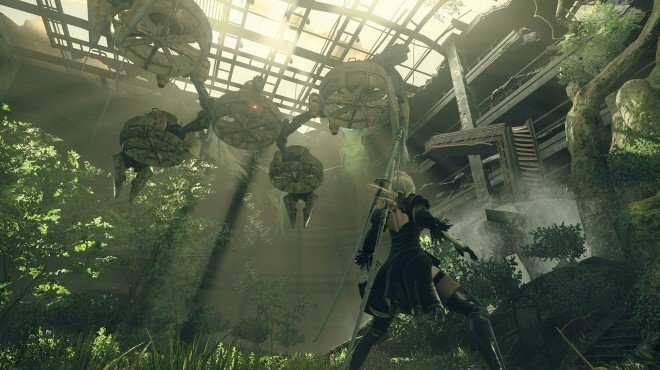 Weird Machines is a Main Story Quest in NieR: Automata. "Driven by grief at the loss of his brother, Eve has decided to eradicate all Androids, and has begun his attack at the Resistance Camp." As you exit the Abandoned Factory from the quest Twisted Religion, a message from Anemone requesting help at the Resistance Camp will play. Head to the Resistance Camp, careful to avoid the ever-increasing number of machines out in the field. When you get to your objective you will find a group of Small Biped machines eating the helpless androids. Kill them and the lance-using Medium Bipeds, then head towards storage to meet Anemone. Further ahead, shielded Medium Biped and Small Stubby, plus a Goliath Biped attack you. Defeat them all and then talk to Anemone again. Outside the camp, by the waterfall, a multi-legged goliath boss appears. Stay out from the water and range it until the electricity disappears, then close in for some melee damage - but be careful of its drill attacks. After a while, it will summon Small Stubby enemies to aid it. When it turns into a ball, dodge its charge and then land a few melee hits before dodging again. It will eventually trigger a cutscene where 9S rejoins your party and starts Threat Disposal.